Describe your Gallery space: The Encaustic Center is a working studio and gallery. We give beginner and intermediate workshops, classes and have workdays in painting with wax. We also do shows for artists working in wax. How long has the gallery been open: We’ve been open a little over a year now. What is Encaustic: Encaustic painting is an ancient process developed by the Greeks. The word encaustic is Greek and it means “to burn” or “burn in.” In its simplest form, encaustic involves melting wax with a resin to create encaustic medium. Pigment is then added to create encaustic paint. The paint or medium is brushed on when it’s hot and each layer is fused to the surface with a heat gun, torch, or iron. The wax can be built up, scraped into, and objects can be embedded into the surface. 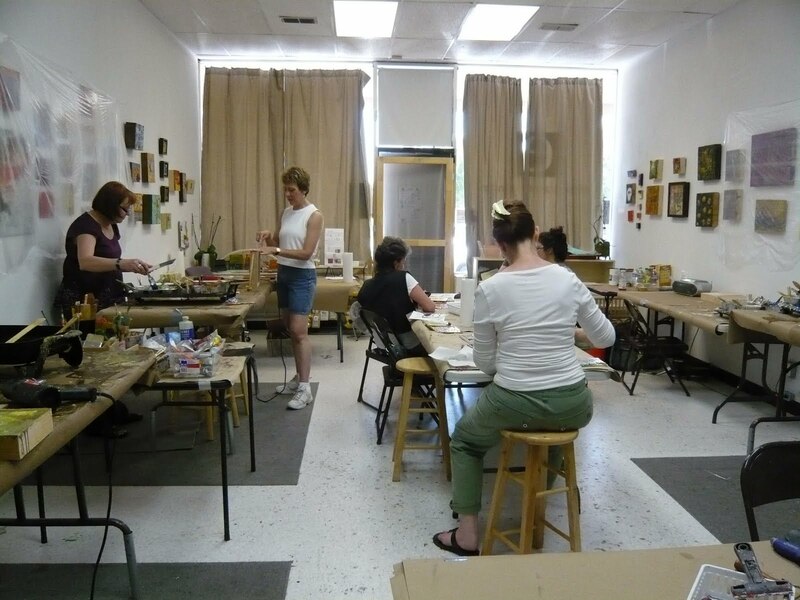 Tell us more about the Encaustic Studio: The workshops and workdays are a great joy! Everyone enjoys the process whether they are brand new to it or have been working in the medium many years. Our beginner workshops give you all you need to know to start creating right away. The wax has a beautiful elusive quality. Some of the many techniques that we teach include, collage, transfers, stenciling, texture and monotype so you can incorporate what you may already be doing in other mediums into your wax work. We are so fortunate to have the center here. Often times artists have to go out of state to find such facilities. Do you have exhibits: Yes, we invite encaustic wax artists to have shows here. We’ve had some really exciting shows. You can view pictures of the art and shows here: http://theencausticcenter.com/exhibitions.html The artists usually do demos of the process at the opening. Each artist has their own way of working with wax and of course, each artist’s work is as individual as it would be in any other medium. Do you work with local artists or artists from all over: So far we have invited local artists but are certainly open to showing encaustic artists from all over. We did have Patricia Baldwin Seggebuch in from Seattle for a 3 day workshop in January She is the author of Encaustic Workshop: Artistic Techniques for working with wax. What is your personal favorite exhibition from the gallery, past or present, and why: The Waxy 100 exhibit was fun because it included work from many of students / artists and the work was very affordable. 100 pieces under $100.00 dollars! How many shows do you have each year: about 6 and we do a big fun holiday bazaar near the holidays where artists bring all kinds of hand crafted art and crafts for sale. I managed to purchase many gifts myself last year! What is a typical event like at the Studio: Our receptions have been well-attended and the demos that the exhibiting artists do have been a big hit. We also have live music, food and wine! What new things do you have in store for this year: More intermediate workshops including specialties like monotyping, heavy texture, stencils and masks, and incorporating photography. Hopefully another visiting artist workshop soon. Do you have any up coming exhibit that you would like to tell us about: We currently have the work of Peggy Epner and Cheryl McClure up. The show runs through May 29th. http://theencausticcenter.com/ Our next opening will be the work of Nancy Ferro on August 20, 2010. The Encaustic Center rocks! Deanna and Bonny are wonderful artists and people!